On the third of the Twelve Days of Christmas at The Restaurant at Meadowood, Christopher Kostow gave to me Phillip Foss of the restaurant ELideas in Chicago. 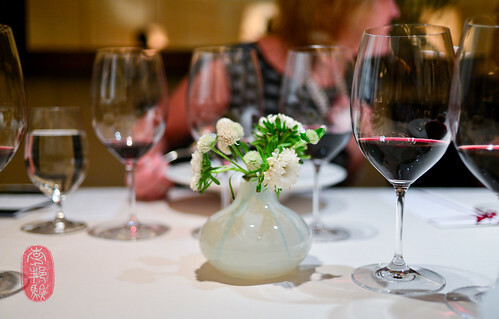 When Phillip Foss left Chicago to come to St. Helena for the event, his ten-seat restaurant (which only serves one-seating each night), was under renovation. When he returns to Chicago today, after cooking at the Twelve Days of Christmas at Meadowood Napa Valley last night, his restaurant will now accommodate twenty-four seats. Foss’s path to ELideas (the restaurant is inspired by a number of “els,” including Chicago’s famous “elevated” public train system, and the word “el” in Hebrew, which means “deity;” Foss has Jewish ancestry) is a particularly colorful one. Born and raised in Milwaukee, he moved down the shore of Lake Michigan to cook in Chicago. From there, he went to New York, where he cooked for nearly a decade, first at Lafeyette under Jean-Georges Vongerichten, then at Barry Wine’s Quilted Giraffe. He then cooked at Le Cirque, when it was in its original location (now Restaurant Daniel), and moved with the restaurant into its second location in the Palace Hotel (now Gilt). Leaving New York, Foss spent nearly a decade traveling and cooking around the world – Bermuda, Brazil, France, Hawaii, and Israel – before returning to Chicago to take the executive chef position at Lockwood Restaurant at the Palmer House (at a question and answer session at the Culinary Institute of America yesterday, Kostow joked that, based on Foss’s resumé, he must be seventy years-old; he’s in his early forties). He left the Palmer House to opened a food truck called “Meaty Balls,” which he says really brought out hisl sense of humor, which he admits is a bit irreverent at times (he sold meat balls with names like “golf balls,” and “sweaty balls”). But food trucks in Chicago are difficult. At the time, food trucks weren’t allowed within 200 feet of a restaurant, and no food could be prepared on a food truck. So, when Foss stumbled across the current ELideas space, he moved in. Opening his own restaurant hasn’t tempered Foss’s sense of humor. If anything, the freedom to cook what he wants to cook at ELideas has brought it out. 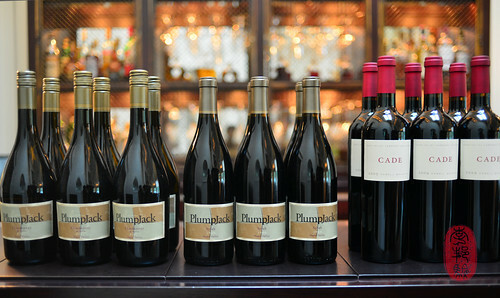 And last night, we saw a bit of it at the Restaurant at Meadowood, where he teamed up with Christopher Kostow to present a seven-course menu paired with wines from Plumpjack and Cade Wineries. I had the great joy of sitting down to dinner with the vintners, John and Anne Marie Conover. Foss likes to revisit childhood memories in his cooking. Stopping shy of whacky, his food – much like him – is big-hearted and playful. Last night, for example, he served a canapé called “Fries and Frosty,” which he says has been one of the few mainstays on his menu at ELideas. This was a potato crisp sandwich filled with potato ice cream that had been infused with vanilla. The little sandwich sat on a bed of melted leaks. A warm vichyssoise was poured around it, making a little moat. Together, it was crispy and creamy, warm and cold; the contrasts you’d find eating fries with a frosty. Foss’s cooking is also flavor-forward. The antelope tartare that he served last night was a conversation starter at my table. The tender antelope meat was garnished with shaved matsutakes, twigs of roasted salsify, and huckleberry sauce. Together, it was a bold and rich combination of earthy, beefy, and sweet flavors. Wild and raw, this dish evoked an autumn hunt in the woods. Christopher Kostow’s tortellini of rutabaga was stunning. The pasta was beautifully made. The thickness was perfect, and so was its texture, a slightly elastic wrapper for a warm, creamy rutabaga filling. Served with meaty nuggets of porcini and crispy shards of dried ham, it was immensely flavorful and comforting. I also really liked The Restaurant at Meadowood’s pastry chef Daniel Ryan’s “German Chocolate Cake” dessert, served as a pretty little verrine of steamed chocolate cake with dark chocolate and cocao nib dentelles, pecan pralines, and caramelized coconut cream. At the table, the cooks shaved coconut sherbet, which had been molded into coconut shells, over the cake. I loved this dessert when I ate at The Restaurant at Meadowood in September, and I loved having it again last night. You’ll find the entire menu from last night’s Twelve Days of Christmas Dinner with Phillip Foss, and a slideshow of the dinner below. uni pudding, baby shiso chawanmushi chip. Porcini, nasturtia, dried duck ham. Malt, huckleberry, matsutake, roasted salsify. Celery root, red onion, “Chinese take-out”. Chestnut “paper,” quince, tiny licorice. ~ by ulterior epicure on December 12, 2012. Thank you for sharing your amazing culinary adventures. I’m enthralled every time! Phil is a truly impressive chef with a great vision – was lucky enough to eat at EL twice before the renovation and can’t wait to go back.